I poke. I push. I prod. I try to get people out of their cubicles and traveling the world. That’s what I do. That’s my thing. I show others that traveling doesn’t have to be expensive, that anyone can do it, and that your fears are unfounded. I try to be a living example of that. Judging by the emails I get from people, I think I’m successful at getting people onto airplanes and into the world. 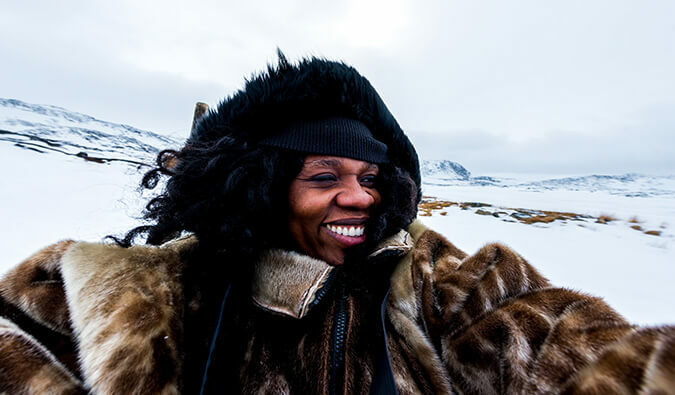 But last month, I faced a fork in the road about what to do when my trip ends: do I move to New York City right away or do I move to Sweden for six months? 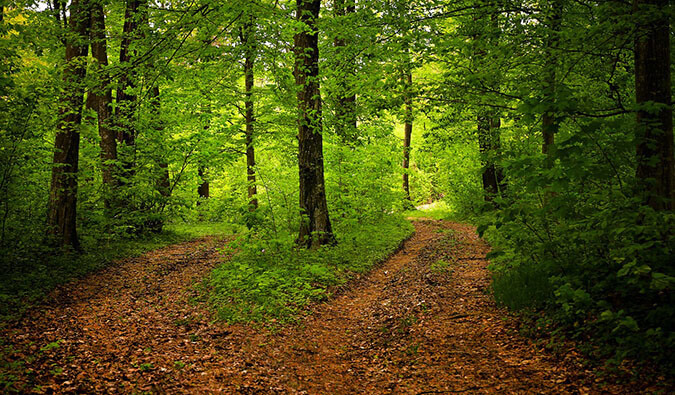 Once you go down a path, there’s no turning back, and I was very torn on what to choose. But I decided to choose Sweden. The guiding principle in my life is no regrets. I don’t want to be on my deathbed saying, “I wish I did…” and I think that if I didn’t move to Sweden, I’d always regret it. I’d always wonder what might have been. What would life have been like if just for a moment I finally got to live in Europe? What possibilities and opportunities did I pass up? So in July, I’ll be getting on a plane to Stockholm, where I’ll stay until January >when my book is released. I’d leave sooner, but I have some conferences and plans in the United States that I need to attend in the meantime. As I lay awake one night, I realized that if I didn’t move to Sweden, not only would I regret it, but I’d also be a hypocrite. After all, instead of facing my fears and reservations, I’d be taking the easy road. New York is easy. I know it, I’ve lived there, I have friends there. I don’t need to worry about visas, languages, or anything else. New York would be the easy, comfortable choice. Instead of breaking out of my comfort zone, I’d be staying firmly in it. And if I did that, how could I ever again tell people to break out of their own comfort zones? All you have to judge me by are the blogs I write and the information I share. Based on what I present, you decide if I’m trustworthy enough to listen to. I trust Trey Radcliff when it comes to photography because of his amazing photos, the fact that he only promotes the products he would actually use, and the people and news sources that vouch for him. I trust he knows what he is talking about. And trust is the currency of the Internet. I can’t tell people to conquer their fears, live their dreams, and travel the world if I won’t even do that for myself. With so many sketchy websites these days, trust is in short supply. All you have online is your credibility. So late at night, I thought about all the emails I get from the people who have told me I’ve inspired them to take a trip. I thought about all the messages from the people whose fears I’ve helped vanquish. I thought of all the people who told me a blog post was exactly what they needed. And then I thought about how deep down I knew I wanted to move to Sweden. There was nothing I wanted more. I want to learn the language, eat the food, meet the people, and explore the countryside. New York can wait six months. I’ll miss it, but it will always be there. Yet if there was no doubt in my mind, how come there was doubt in my mind? Because I was too scared to make the leap and commit. It was easier to stay in my comfort zone. It always is. But I realized that I’ve helped so many people take a deep breath, close their eyes, and just go for it that not doing it when it came for my own turn would make me a hypocrite. And that realization removed my doubt and made me commit. And so in July, I’ll move to Sweden. It may be great. It may be awful. I may come home early or I may stay forever. But at the very least I’ll have practiced what I preached. I can wake up every day knowing that I did what I tell others to do: I seized the day, conquered my fears, and leaped into the unknown. Because if I didn’t do that, I’d be a hypocrite. And I’d never be able to look at myself the same way again. July? Damn, that means I’m probably gonna miss you in Stockholm/Sweden by about a week or so. Best of luck! Hope you enjoy Sweden, its a lovely place to live. I did my Erasmus for a year in Finland (Swedish speaking part) and loved every moment of it, such a wonderful place in the world to live. Have a great time and good luck with the language! Congratulations! Good luck with your move and the impending release of your book! It’s a hard city not to love. You have to I think! I think you made the right choice. It’s not easy, but sometimes you just kind of have to dive in. Excited to read about your adventures in Sweden. Ah!! Congrats, that’s so awesome!! I was just thinking about Sweden today too! Not in any in-depth, complex sort of way – but definitely!! Good luck!! Great post! If traveling teaches you anything it to take chances. The world is small, the opposite end can be reached in a days travel so why not experience as much of it as one can! Good luck on your move! I am moving to Germany in April as well. I have always wanted to live in Europe so I am not letting this invitation pass me by! I’d love to! Let me know! Great decision, both to not be a hypocrite and to move to Sweden. And I agree with you on the life lesson part, none of this “I wish I would have, I think I could have and maybe I should have”, no life mulligans allowed right? There are no mulligans in life. Life only moves one way – forward. Matt, I was pumped to read that you had made your decision today. After following you for the past few years, and finding out that you’ve made the decision to end your long run, I was excited to see where that would take you next. I can imagine that making the decision between New York and Sweden was difficult, but I was thrilled to hear that you have chosen to move to Sweden. Despite not actually knowing you, I had to share the news with the people around me because I was so excited. I just love to see people be happy, and make a leap to the unfamiliar. Did the people think you were crazy or were like “who?” but I thank you for being excited too. The new adventures await! We’re a tad older and traveling with a dog, but even at the times when we miss home (and there are many), I never regret the decision we made. And others have said it well, New York will wait, you have many, many years ahead of you to get friends, neighbors, favorite hang-outs :o) Not to mention how fast six months will go by. Looking forward to seeing photos and hearing about your time over there :o) It’s on our list for when we are able to travel internationally. 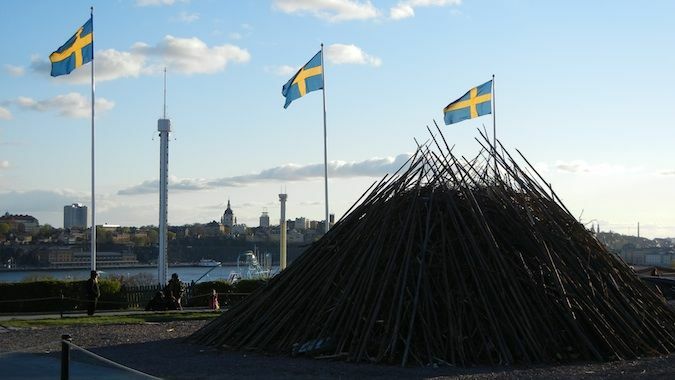 Of all places in the world, when you started your adventure did you ever think that you would end up living in Sweden? No, my original goal was to travel for one year and then get a desk job. It didn’t quite work out the way I planned. You’re right, New York isn’t going anywhere but July is 5 months away, something else might come up in the meantime. Good luck whatever and wherever you end up. Hi Matt, great news you’re heading to Scandinavia. I moved to Norway in May last year and absolutely adore it here. The long distance buses, internal flights and trains are great value so you should be able to see as much of Sweden, Norway and Finland as you like 🙂 Have fun! My cousins will probably want to see me so I’ll be visiting Norway I suspect! Where are you? I’ll be all over the place so I suspect I will take you up on that offer! Wow – moving and personal – this really is quite a big fork in the road. Exciting opportunity to live in Sweden. I am sure you will be able to relax into it and love it! New York will still be there when you are done. Very excited about your book – not long to go now. Looking forward to hearing more about your experience in Sweden. I have a lot of family in Norway and hope to get out that way in the next couple of years – covering both countries is on the cards. Norway is extremely beautiful. I have some cousins in Oslo myself and I love visiting. Save up though! It kills the wallet! There’s much to be said for facing any uneasiness and fears and just going for it. You gain so much in return when you’re willing to put yourself out there. Thanks Bessie! I hear all is good in Burma! Sorry I missed you when I was in CM! Hope to see you two soon! SO glad it’s Sweden as the outcome of your having to choose! You may not be Nomadic Matt once settled (though possibly semi-nomadic), but it will be a lot less of a shock to you to be in a foreign country with easy access to Scandinavia and Europe than if you moved back to New York. Sweden will still feel like an adventure with so many new things to adjust to, whereas NY would feel like coming to a halt…game-over. I wish you lots of happiness in this journey. Thank you! I will always be semi-nomadic. Travel is in my blood. Love hearing the reasoning behind your choice. Sometimes it is so hard to just make the leap and it’s great to have examples of other people doing it to reassure and inspire. Glad to hear you’ve reached a decision — and glad that it’s this one! You never know what you might end up regretting … looking forward to following your adventures from Sweden! Crazy to see this since I just made the same decision last month! Hoping for a May/June move… You’re going to miss Midsomer! Where are you moving to? I also haven’t decided which visa I want yet. Since it’s just for 6 months (as of now), I can get a tourist visa. That might be enough. I’m doing a “moving to Sweden to cohabit with a Swedish citizen” residence permit visa… interview at the embassy in a few days! *fingers crossed* I though the tourist visa was only good for 90 days? Trust, and not being a hypocrite, are two of my motivations in life as well. You’ve maintained your credibility since day one, I hope I can do the same. You certainly are one of my travel inspirations, I like the way you tell it like it is. Keep it up, Matt. Nate, flattery will get you everywhere! I’m sharing an apartment with friends! BTW what visa did you come in on? Good one! Always knew deep down this is where you were leaning towards, but you’re right, that out-of-your-comfort-zone decision is still tricky and the hard choice, every time. No matter how often you push yourself to make it! I feel like a lot of people knew before I did. Seems everyone wants to move there! We should have a big party! My book launches in January 2013 so I need to be back in the states for that. No, there’s no special somebody I’m going for (contrary to popular belief). I’m going to search for Santa up north! Yeah, I don’t really like the cold. My mother is having a hard time believing I’m going to stay beyond the temp dropping below 20 C.
Wow – It sounds like your primary motivation for moving was to set a good example. Rock on. That takes both guts and dedication! Sweden won’t be cheap though 😉 A beer costs like $10. It’s worth something! Thank you. I am very happy you chose Sweden. When you first posted about making a decision, I was like, really, hands down Sweden! You can do NY anytime you want. Why not live in a place you love but have not truly experienced in a full capacity. I am so excited to be along with you virtually for this Swedish ride. Awesome Matt. No matter what, it’s always good to follow your gut, and if you don’t like it, it won’t be the end of the world. Just another decision you made while deciding how to live your own life. I am one of those people you speak of up top, I trust you. Thanks for inspiring us and hope you love Sweden! I have been to Swedem two times. I like this country, though, there are not so many historical attractions there. But it is very clean and comfotable country. Hey Matt, I know the feeling all too well. I sold everything and moved to China back in 2008 right out of university. I had no idea how long I’d be there, but I stayed just under 3 years to move back to Florida to help my dad with his business. I knew all along the job wouldn’t be there forever, because my desire was to sell his business and do something else (long story about disability). I’ve been home just under a year, and I’m itching to travel and do something else again (like move back to China and start a business with the money I’ve saved here). I’ve become complacent and scared about leaving my family again, but I know my heart is still in China, so I have to choose between finding a “real” job, or going back to the Middle Kingdom to find my fortune, hehe. Great decision Matt!! 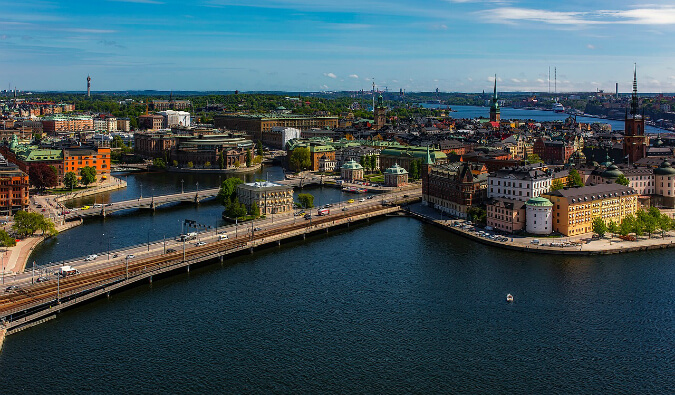 You will love Stockholm! If you need someone to show you around, let me know. I have good friends there who have traveled a lot in the past as well. Good on you Matt! I just finished a barter gig shooting video and pics for a green tortoise adventure that does a baja trip living on about $20. a day for the last 2 weeks. I sat on the fence a short while thinking I “should” really be looking for actual PAID work. But travel is my passion and I just trusted that it would all work out regardless of the money issue. So off I went and so far it has panned out wonderfully. It was an AMAZING adventure. So I concur fully! One has got to follow one’s bliss! Keep following your muse brother! Fantastic information..thanks to a friend, I was able to live in the UK for 5 months…I am back in the US and having a very hard time with my loving friends who don ‘t understand why I am so homesick for Europe. I have both Romanian and polish grandparents, and am hoping to find out how to claim my legal right to stay in Europe through one of those lineages…..any pointers would be very much appreciated! I’ll live in Stockholm and travel the region. You’ll come to Stockholm while we’re away on our summer island, + we’re doing a long roadtrip from Stockholm down to the French Riviera with lots of detours (lol), we’ll probably not be home again until the beginning of September or something… let us know if you want to meetup for a beer or anything else – and feel free to ask us anything you need to know! 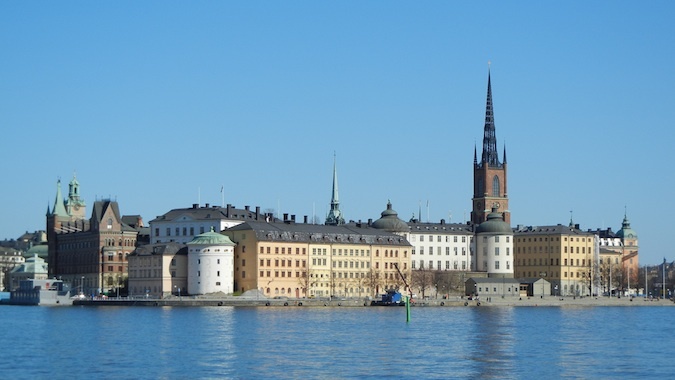 Stockholm in July is glorious–you will love it! But as someone who has lived in this city for 7 years now, I have to admit that November is just plain dark. That said, you will love the adventure. Lycka till! We have just met a nice young couple from Sweden in the place we volunteered and they are very nice. You will have so much fun in Sweden. Definitely you made a very good decision, not because it is better than the other, but because you seem so convinced about it. Again Matt thanks for sharing your travels with all of us. Hope to meet you soon somewhere. The invitation to cycle with us for a couple of weeks still stands if you want to. We would be glad to pedal with you wherever we are. Cheers amigo and safe travel. Exciting stuff! Sweden is an amazing country and the quality of life there is brilliant. I am looking to move back to Sweden in either April or July of this year. Summer beers in the archipelago somewhere??!! Depending on when you get there we may overlap. 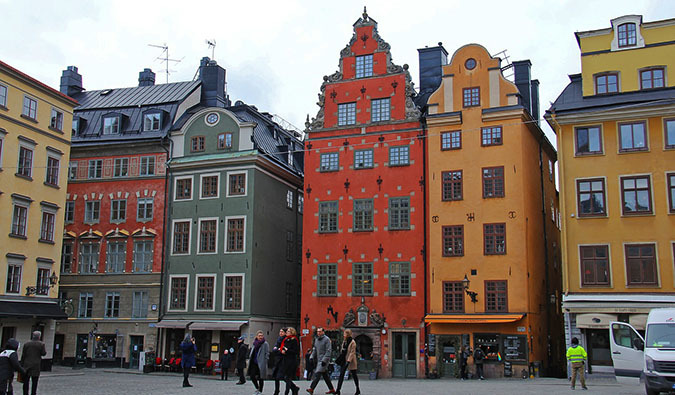 I’ll be in Stockholm July 1 – 9 visiting friends. I don’t get to Stockholm until July 9th! See ya at the airport. You are such a huge inspiration. Since going on my first solo trip at eighteen I’ve been waiting for the right time(when university is finished) to take off and explore the world for years at a time. I love your blog, thank you for all of your posts and good luck with Sweden! LOVE your spirit and your site, thank you!! We’ll be in Stockholm early Feb, so unless you’re so in love with it you can’t leave we’ll miss you! Hack swing dancers, we are potentially looking forward to Herrang dance camp in June. Thank you for your recommendations to Stockholm, I hope you have had a great time there. *I’d love to see *why* you chose Stockholm, and what other places you have lived in! I’ve been in Toledo Spain, Paris France, now in London, will be in Stockholm soon. Learning Swedish, is hilarious. I left Stockholm months ago but have a great time! Well said sir. This is a narrative on taking the leap to travel, and also on any decision in life. We are often bogged down in fear governed by societal preconceptions. If we break out of our fears, we could be much happier.